Once we start to recognise that our experience is made inside us, by us; that it is tinted by our values, attitudes, beliefs, attention etc. then we can easily let go of strong conviction about our past. 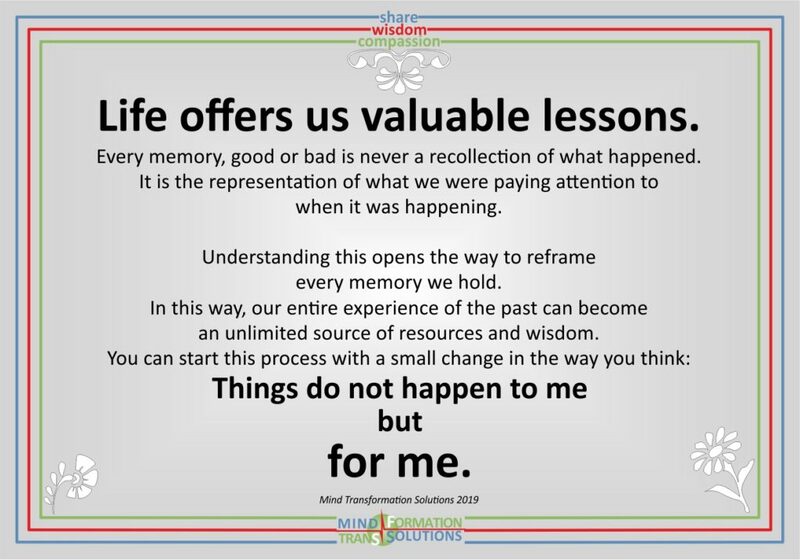 Then it becomes a matter of skills and techniques to extract all positive, valuable lessons from our past. When our past start shifting from negative to positive, our experience of “the now” can shift as well. This process can be the beginning of radical transformation. The beginning of the creation of life you want. You can just start with this little shift: if things are happening for me – what can I learn now, learning of which will allow me to grow?